So recently I went back to school and became a student of the School 4 Change Agents. Created by Helen Bevan and the NHS Horizons team, #S4CA is all about building power through agency and driving positive change. It’s open to anyone and as its now in its 5th year and with 14,000 people from all over the world having taken part, you can see it's pretty darn popular. Change programmes generally tend to bring out the worst in people. Colleagues you have worked with and known well for years suddenly either turn into corporate identikit clones, telling everyone how great everything is going to be, directly challenging negative behaviour with generally no regard for people’s feelings, or they sit on the opposite end of the scale and become stuck in their ways, looking at the glass half empty and becoming more obstructive. Sound familiar? 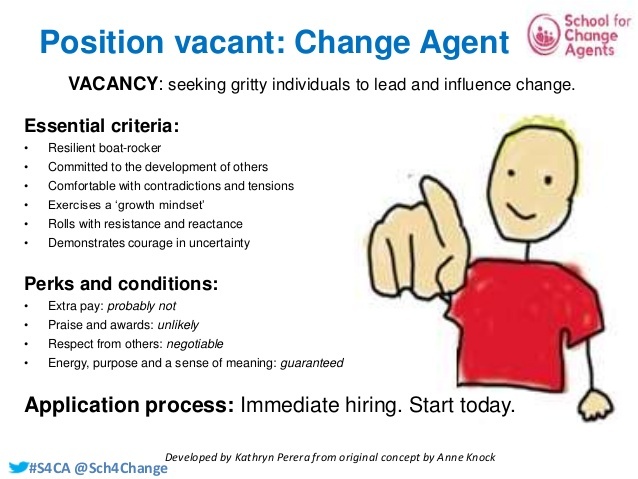 Effective change agents are neither of these things. Over the past 5 weeks, Helen & the team have taken us students on a pathway of learning, self reflection and provocation. We've not only learnt a toolkit that will support us in our journey, but we've also challenged our own behaviours and perceptions, providing us with the foundations to confidently change the world one small piece at a time. Without rebels, the story line never changes. Here, the rebels Helen et al are referring to aren’t loud and disruptive. Well, they might be, but they are also responsible, do what is right and think about things that others don’t see yet. There has always been a slight negative connotation to the word but the fact of the matter is, without them, things will always stay the same. The difference with the rebels that we seek in leading successful change is the fact that they walk the fine line between rocking the boat just enough whilst staying in it, drawing attention to things that need to change whilst at the same time considering people's feelings and concerns. These rebels don't seek permission to lead but they do so in a collaborative manner, building the shared common interest that is so important to successful change. So less rebel without a cause, more rebel with passion and resilience. Now, I'll admit, I think the word influencer is massively overused. I mean, on Instagram, any man and his dog can claim to be one. In a change sense though, individuals who are highly connected have twice as much power to influence change than those in a hierarchical position of power. When you consider that 3% of people within a social ecosystem have the power to influence 85% of others, you have to ask yourself why organisations haven't cottoned on to this sooner. When you look and realise that of those 3%, very few of them are in managerial positions or have the hierarchical permission to lead on change, you start to realise why. 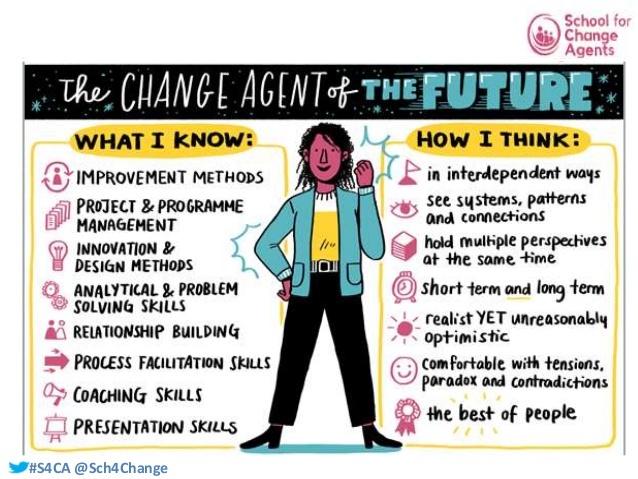 #S4CA isn't about revolting against structure and hierarchy - in fact, its the opposite, acknowledging that you need some form of structure, regulation and management, but at the same time encourage collective agency, mutual trust and developing leaders from anywhere in a business. 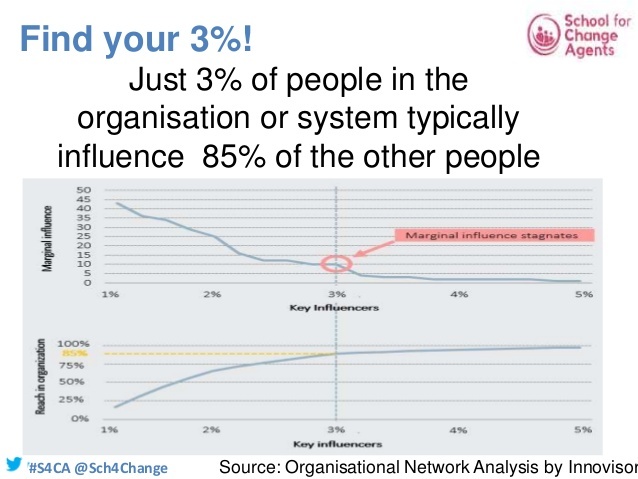 Knowing who your 3% are and staying connected with them on all platforms is the best way to help drive successful change programmes. Telling people what they can't do is a sure fire way to get a reaction, but not the one you were hoping for. Step back and look at how your organisations' influencers engage with their audiences. Encourage and support them, but whatever you do, don't try and put them in a box. And if you are one of the 3%? Keep doing you! For the record, I'm not slating PM's - hell, that is my background, and I know first hand the discipline and extensive skills that are required to ensure projects are run effectively and successfully. I also know that project mentality, even in an Agile approach, encourages clear organised stages, focussing on outcomes and how to get there, less on individuals and building shared common interest. Talking at people, not to them. Transformation can only occur when you create a dialogue and relationship with the people that you need to bring with you on the journey. Giving people a narrative inspires people to act, as they can connect the what we do with the why, which is especially important if you are asking them to make changes to their behaviours. A good narrative isn't enough by itself though - you need to show you are truly passionate about the call to action so people can connect on an emotional level and build that all important trust. If you aren't passionate, people will soon see straight through it. Change agents operate at the edge of challenge and need collective momentum to move that forward successfully - narratives are a sure fire way to help connect heart and head. It's also important to encourage failure - how many times have you heard 'we do it like that because any other way won't work'? How do you know if you don't try! An important part of change is acknowledging that it is messy, totally not linear and it gives zero f's about how you think it should work. People need to get good at failing miserably and learning from the experience, so testing and prototyping are really good ways to have a go and make that narrative all the more richer. In this ever changing world of work, the fact of the matter is change happens daily. 30, 60, 90 day change projects are the norm, replacing old 2-5 year programmes simply because of the understanding that in this day and age, what you are doing now is probably going to be out of date by tomorrow. OK, that's a slight exaggeration but I'm not far off. Either way, different skills will become more desirable in the future than they are now, so this needs to be considered by organisations in cultivating their culture and future colleague learning and development. Making small changes today will reap bigger benefits in the future. I for one am going to start using the two steps down rule - so if I have a goal to achieve X in one month, I'll begin by thinking about what I can do today.